05. MUSLIMGAUZE - Gadaffi Inc.
Limited edition of 500. 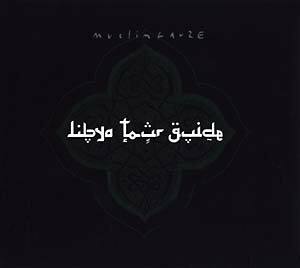 Originally issued as the third LP in the limited-edition Tandoori Dog box set (1998), Libya Tour Guide is reissued here as a standalone CD following corresponding editions of the box's first two discs, Jaagheed Zarb (2008) and Tandoor Dog (ARCHIVE 013CD, 2013), and again the increased space of the CD medium has allowed for the inclusion of previously unreleased material from the original tape. Although a version of "Rebiana sand sea" originally surfaced on the 1998 Melt EP, it is restored to its proper place in this sprawling 22-track CD, along with "Tubruq sand bank" and the 12-minute "Aqua Tingktyur." As with many of Bryn Jones's longer albums as Muslimgauze, Libya Tour Guide ranges over different sounds and modes as it goes, from the near-collage of short pieces featured near the beginning to the subdued, sinister pulsing of "Great satan shadow" to the extended, sometimes digitally shredded journey of "Aqua Tingktyur." Even more than normal, here Jones's tracks comment on each other, with the already hectic squiggles of "Benzedrine, effendi" immediately answered with the fiercer distortions of the same sound on "No, benzedrine, effendi" and "East of tarabulus" taking the listener further than "Tarabulus." The result, whether it's the richly echoing hand percussion of "Kurnel" or the choking static of "Rebiana sand sea," is as intoxicating as always.